Are you ready to shine in your next interview? This comprehensive package provides expert assistance to teachers aspiring to leadership positions in WA government schools preparing for interview. Samples of the various interview instruments used by panels. Preparing for the interview - there are many things you can do well before the day. 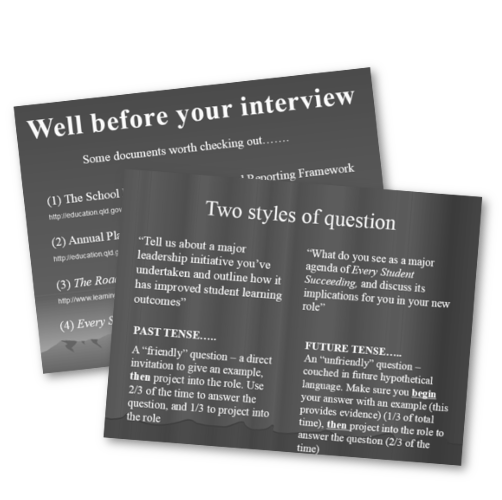 Conducting the interview - how to interpret and answer the different styles of questions. Closing the interview - how to convince the panel that you're the one. This package is designed specifically for the WA government system seeking promotion to Principal, Deputy Principal, Head of Department, Head of Learning Area or Program Coordinator. Printable booklet of clear directions, tips & tricks, ideas and examples. Supporting PowerPoint presentation for extra guidance preparing for your interview.